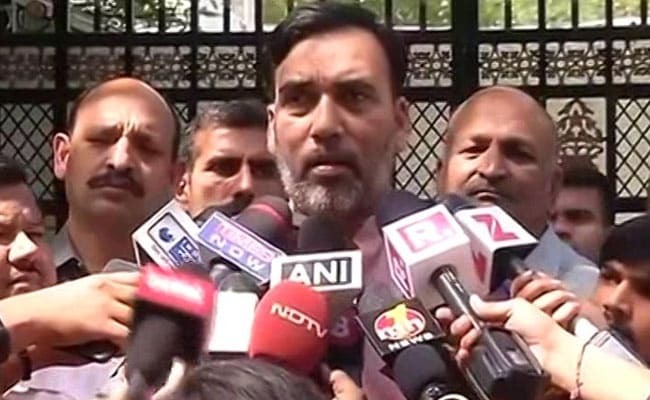 Delhi's Labour Minister Gopal Rai its new convenor of the Delhi unit of Aam Aadmi Party. New Delhi: The Aam Aadmi Party on Thursday appointed Delhi's Labour Minister Gopal Rai its new convenor of the Delhi unit, a day after it suffered a humiliating defeat in the MCD polls. The decision to appoint Mr Rai as the party's Delhi unit chief was taken in AAP's Political Affairs Committee meeting which lasted until midnight. Mr Rai will have a task cut out after the party's defeat in the recently held Rajouri Garden by-polls and MCD elections. Sources said he has been asked to come up with a road map to bolster party's prospects in the city. The party also accepted resignations of AAP's Punjab in-charge Sanjay Singh and co-in-charge Durgesh Pathak after the party's poor performance in the state polls. The AAP had bagged 20 seats in the state polls held early this year, much below its expectations. Resignations of AAP's Delhi unit convenor Dilip Pandey and Delhi in-charge Ashish Talwar were also accepted. Sources said the party leaders discussed the reasons behind the AAP's defeat in the MCD polls and about "gathering of evidence" against the "rigging of EVMs". Speaking to reporters, Mr Singh said, "The party introspected on what went wrong in the polls and where we fell short. EVMs were also discussed. The party will work on all levels, structural and booth level, and make necessary changes." Earlier in the day, Mr Kejriwal met AAP MLAs and asked them to go back to people and introspect the reasons behind the poll debacle. The newly-elected 48 councillors also met the chief minister at his residence. Talking to reporters after the meeting, AAP legislator Vishesh Ravi said, "In the meeting, it was decided that MLAs will go back to people and try to find out where has been a communication gap between the legislators and them". Mr Ravi, the MLA from Karol Bagh, said that in the meeting with Mr Kejriwal, the EVM manipulation issue also came up for discussion. "The AAP will soon decide its future course of action on this issue. At present, related evidence (pertaining to EVM manipulation) is being gathered," Mr Ravi said. AAP MLA Nitin Tyagi said, "We need to work at the ground level in our constituencies and also introspect on what went wrong in MCD polls. I think there has been a communication gap between MLAs and people. We could not convince people about the good work done by the Delhi government." "I think people also forgot how the BJP in the MCD had failed for the last 10 years," Mr Tyagi, the MLA from Laxmi Nagar, said. Another AAP lawmaker, who did not wish to be named, said that Mr Kejriwal has asked all party legislators to not be upset with the MCD poll results and go back to people.